The Missions feature allows people to register for a mission trip, non-travelers to make a payment towards a mission traveler, travelers to pay additional money towards their mission trip and anyone to make a general contribution towards the mission trip. Three pages are required. Mission Trips that have not met the maximum team size display. Approved travelers can make additional payments. Non-travelers can contribute to the Mission trip or to an approved traveler. 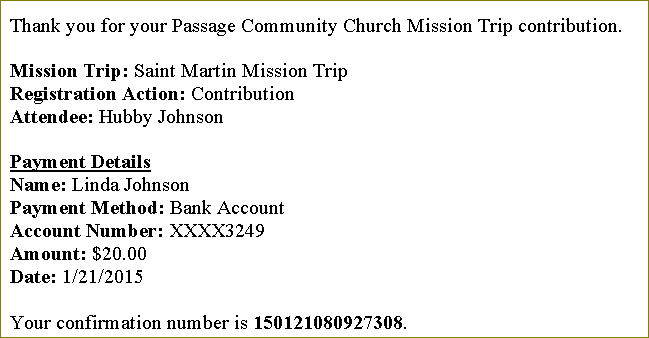 Contributions made toward the mission trip creates a separate batch. This functionality is required to be behind the Arena Member Login. Start the Mission Trip Deadline and Mission Trip Registration Reminder Agents. 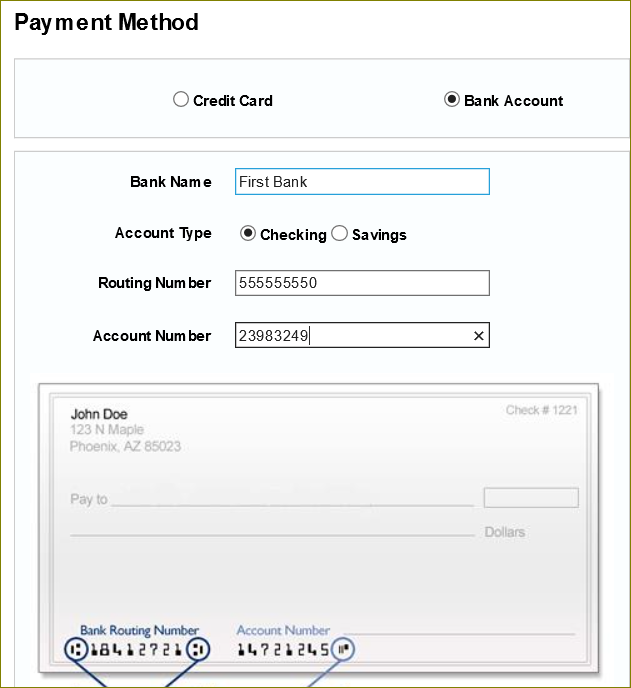 Add a Payment Gateway provider. This is required for Missions. 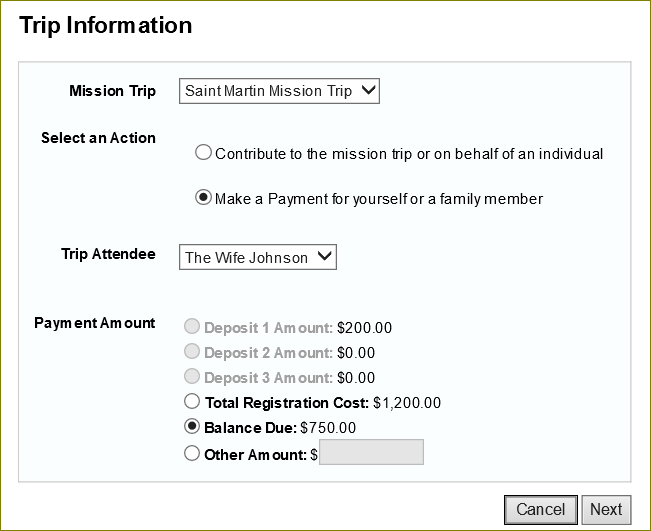 Customize the Mission Trip Registration Deposit Reminder, Mission Trip Registration Reminder and Mission Contribution System Emails. 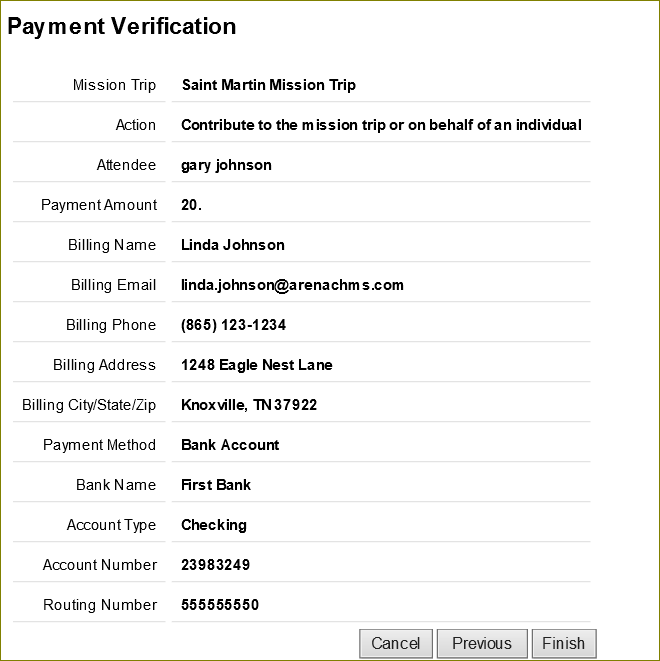 Customize Mission Arrangement, Mission City, Mission Country, Mission Purpose, Mission Region, Mission Register Type, Mission Support Type, Mission Trip Role, and Mission Trip Status Lookups. 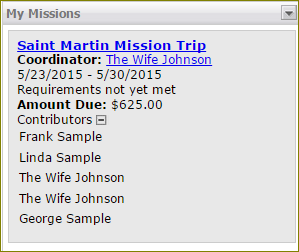 •Missions page – This page allows users to select a mission trip. This page requires the Mission Registrations module, selecting ACH and CC Payment Gateway Names and a redirect cancel page. •Mission List page – This page lists all available Mission Trips. This page requires the Mission List module, where you can specify which trips to display. •Mission Registration – This page confirms registrant information. This page requires the Mission Registrations module, with ACH and CC Payment Gateway Name selected, and Cancel Page redirect page. 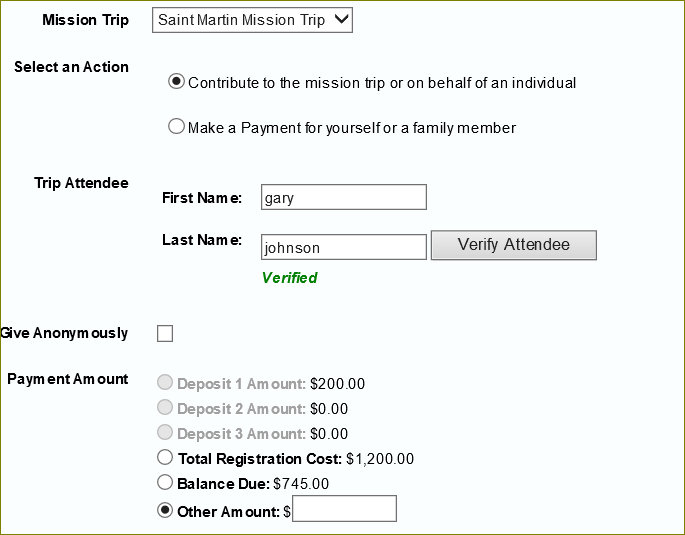 On the first Mission page, the user can select the Mission Trip. Only active/available mission trips display. After selecting an active trip, the user can either make a payment towards their own trip or enter a first and last name to make a payment towards another traveler. Because the user has signed in, Arena knows what trip and person to display. If the user elects to make a payment towards a traveler, Arena first needs to verify the person is an “approved” traveler. 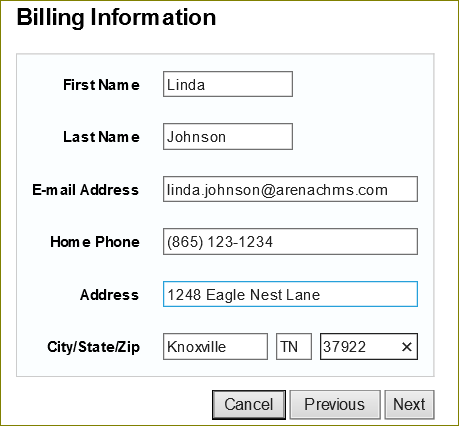 If the name entered is not registered or approved, Arena displays a message stating so. Once the traveler is verified, Arena displays the applicable trip cost information. The contributor can either pay the balance or enter another amount. Contributors can also select Give Anonymously to not display their name on the My Membership/Mission module. The contributor confirms/enters the contact information. Arena updates the existing record. They click the Next button to continue. The contributor selects the payment method then clicks the Next button. Enter applicable payment information then click the Next button. After confirming all information, the contributor clicks the Finish button. A confirmation displays and the contribution is applied to the traveler. If configured, an email is sent to the contributor. If configured, the traveler can also view contributions on the My Membership page on the external (member) portal.